Fluorescent lighting is used in the 24V lighting system of some Mk1 coaches as it is more efficient than incandescent lighting. But fluorescent lamps still use quite a lot of power and tend to go out when the battery voltage drops much below 20V. LED lamps are more efficient than fluo tubes and are a "conventional" shape so can be used in vestibules and toilets of Mk1s and heritage rolling stock. SRPS Railtours purchased small number of relatively expensive golfball outline LEDs to try out in corridor and similar highly visible placements. These bulbs are rated at 3W and replace 25W tungsten lamps. To date there have been 2 failures of these LEDs which are rated to 30V DC max, but logging in the coach in which they failed showed peaks of nearer 40V due to defective cells and subsequent "surging" of the dynamo. SRPS and Railtours also purchased approximately 200 much cheaper LEDs (from China - where else?). These were duly fitted in less visible situations as the bulbs were "corn" shaped, e.g. vestibules, toilets and shoulder lamps. These were rated at 24V and were resistively limited so that running at anything over 24V caused excessive heating and subsequent (many) failures. Disecting one of these corn bulbs got me thinking. The LED stack is usually 8 or 9 parallel chains of 3 series LEDs. 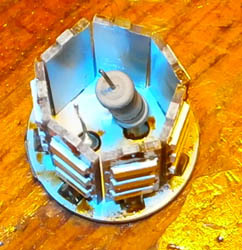 Testing showed that maximum illumination was obtained by about 10V (to include the polarity correcting bridge rectifier) so the rest of the overhead was wasted as heat (14V - well over half the total power consumtion). Out came the power supply circuits data books. Shortly thereafter a regulator circuit was designed and tested. This was easily small enough to fit in the lamp base so it looked as if nothing had been done to it. Until you plugged it in! Varying the supply between about 12V and 36.5V (the most I could get out of my power supply) the brightness was absolutely constant. Another bonus was that as the voltage went higher, the current consumption dropped giving an almost constant consumption of 2W approx, 80% of which was applied to the LEDs. All of the original "resistive" LED corns have now been converted to electronic regulation and are fitted in all the Railtour Mk1 vestibules and toilets. They are also fitted in the shoulder lights of the corridor vehicles. Only one has failed - it was in a vestibule light fitting which filled up with rain water due to a roof leak. 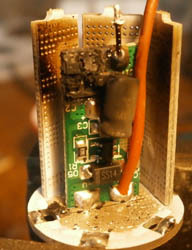 The electronic regulator was fine but the LED stack "died". The Branchline carriages are all fitted with corn LEDs in the vestibules and toilets. The RMB (buffet) has corn LEDs in all the concealed positions around the bar area. All these corn LEDs are electronically regulated for two reasons a) so they will work at full brightness at much reduced battery voltage and b) so that the current consumption from the batteries is reduced. Some of the more expensive golfball LEDs are also fitted in Branchline Mk1s in more "heritage sensitive" positions. Saloon lighting is either fluorescent or an older design of (concealed) LED lighting. It is hoped to upgrade the LED lighting in the not too distant future so it will tolerate much lower battery voltage (14V) than it does at present (19V).